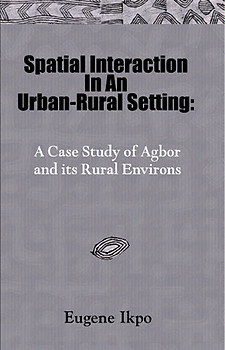 Commissioned for full prepress and print production services to AMV in 2003 by the author, Mr. Eugene Ikpo Spatial Interaction in an Urban Rural Setting was based on his MSc thesis at the Department of Urban and Regional Planning University of Ife (now Obafemi Awolowo University Ile Ife) Nigeria. For further information on how to obtain copies Eugene can be reached via his email address eugeneikpo@gmail.com. SPATIAL INTERACTION documents the conclusions of a thesis Mr. Ikpo wrote in partial fulfilment of requirements for the award of an M.Sc. degree of the University of Ife, Ile-Ife in 1986. The dissertation assessed economic and social interaction in a typical less-developed-country urban-rural setting with tests and other applications of the conventional gravity model. The primary finding was that key economic (and often population) centres beyond study focus settings – intervening influences – mostly affected interaction between interacting unit pairs and triads of settlements rather than the units on their own and by themselves. Consequently, fresh versions of the gravity model are presented for assessment and application. Other hypotheses that attempt to explain select natural phenomena are also presented and tied-in with views of The Creator and His creation. Eugene Ikpo is Nigerian and was formally educated at Federal Government College, Warri and at the Ife University, both in Nigeria. He is an investment banker and is married to Oye Ikpo and they are blessed with a daughter, Lote. 5 ½ X 8 ½ 148pp.